Now in its 5th Year, this popular Seaside half marathon provides runners with some outstanding scenery, history and the opportunity to set a pb on a pretty flat 13.1 mile course. 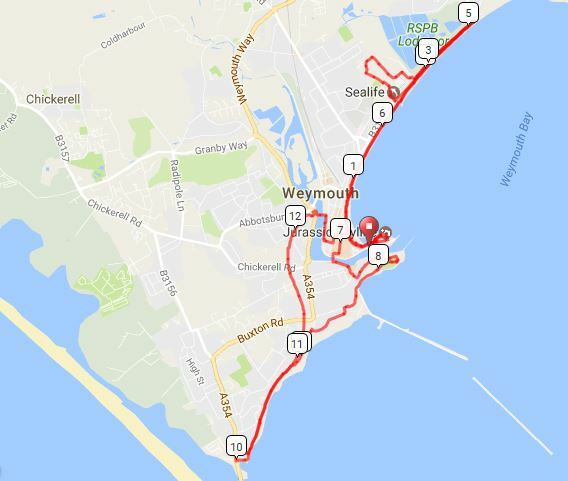 Runners will complete a traffic free, fast course and take in a historical and scenic tour of Weymouths dramatic past and landscape through the town, harbour, sea front and Lodmoor Country Park. The event will start at the Weymouth Pavillion, The Esplanade, Weymouth, DT4 8ED, about an hour west of Bournemouth along the A35. You can also get there via the South Western Railway, which stops in Weymouth. Fancy competing in the Dorset Double? Anybody who enters both the Weymouth Half Marathon and the Dorchester Half Marathon (19th May 2019) will automatically be entered into the Dorset Double FREE of charge and will be eligible for overall and age group prizes based on cumulative times from both events (as well as individual prizes from each event). The course could have been better. Its certainly not flat! The finish layout in 2019 was as if they ran out of space and had to quickly fit in the last 100m. The first half is good, then as soon as it heads out of town, it loses its appeal. Im sure it could be made better. Other than that, the medal is great and the volunteers/marshals are very supportive. Spectators are also very good, due to the layout though, they are quite sporadic. Excellent course, possibly the best I have ran. Very well organised enjoyable race. Thank you for a great day! Really enjoyed the race. Most of the course really attractive and good variety but was a little devalued by up and down stretches. These always feel frustrating and while most of the course was far more attractive than most road races there was a higher proportion of up and back. Generally organisation was good, more space for end of race area, not sure if that is possible but it felt a little chaotic and cramped. Having Pavillion as a centre at the start (to shelter from the weather, get a coffee etc) was great. Marshals were absolutely brilliant, enthusiastic and encouraging. Atmosphere for a race of this size was excellent and I really enjoyed the experience. Beautiful location - second half of the race quite tough so definitely need to save something in the tank for that ! lovely encouraging emails before and after from the organisers and good comaraderie among the runners - lovely place to run thank you to everyone involved- especially the lady on top of the cliff giving out fruit - you are a star!! The team behind the Weymouth Half deserve a huge amount of praise. They have delivered one of the best races I've been involved in. Everything was well organised, race hq was spacious with massage available and a bag drop which was very well run. The chap on the mic pre race was full of enthusiasm and this was still the case at the finish. The course was stunning as we ran along the seafront then turned and headed towards a section through a country park. We then headed back up to the seafront and ran back towards the start where we headed through the town. Running past Greggs at 7 miles was torture though!! We then ran around the harbour and up in to Nothe Forte, which was unique. The last 3 miles were a nice flat section along a cycle/walkway before dropping into b the town and the crowds at the finish. The marshals were enthusiastic and there were plenty of them. I will definitely be back next year and hopefully get some club mates to take it on. Weymouth Half MarathonThis was the 2nd time I have run the Weymouth Half Marathon. Last year's race was also my first ever race, and on both occasions I loved every minute of it. The scenery is amazing. The support is always great, it's such a great atmosphere . The Marshals are brilliant too. I can't wait for next year's race. I would recommend this race to Anyone. This is a great early season fitness checker for any keen runner building for the London marathon or keen triathlete looking to test running form. Lots of flats to check speed and a few little hills for a test. Have run this last two years but first time barefoot. Would thoroughly recommned this race wither BF or shod!Marsahlls were fantastic and local support good. One of the toughest most hideous of road runs you will ever attempt at just over 682 m or 2240 feet of climbing this road ultra is just another step in the evolutionary chain of your running. With parking close by and the start within 50 meters of the Cider bar, its something to look forward to at the end (as long as someone else is driving!). Its also a great place for your family to relax as you do all the work. The routes are on nice quiet country roads, with aid stations on route and our as always welcoming environment, we want everyone to finish the marathon who starts and if you can manage 7 hours and under then #PUSHYOURLIMITS and enter now. The Frome Half Marathon 2019 will be held on the 21st July. All races start at the Frome Town Football Ground at 10:00 am and make their way through the streets of the town and surrounding countryside returning through the Town centre to the Frome Town football Ground for the finish line. Sign up now to guarantee your place!